? Your LLC offers great protection of your personal assets--in theory. But you still need to show that your business is actually being run inside your company and not by you directly. Keeping a separate bank account for the LLC will get you a lot of the way there, but keeping minutes to record key actions of your company provides the necessary evidence. For example, in your minutes, you will reflect that ownership of business assets, like trademarks and contracts, are held by your LLC. You can clarify that contracts you have been signing have indeed been on behalf of the LLC. Your minute-book is the opportunity to clarify when and how and why these actions were taken.
? You decided your business needed a little extra investment, so you simply moved some cash from your personal account into your business account. Wait. Did you contribute that money as capital or did you loan it to the business? The difference will really matter on down the road when you want to split a dividend with your partner or when you calculate your tax basis. Writing a simple resolution into your minute book to reflect what you intended at the time will avoid this type of uncertainty after the fact.
? Without minuting votes of shareholders or directors to appoint your management, it will be uncertain who the members of your management actually are, and even if you and your partner know, third parties (banks, for example) have nothing to rely on.
? If you have partners or multiple owners of your business, minutes go from being something that is prudent and smart to something that is essential for the health of your partnership. Writing down key decisions and recording them avoids miscommunications and misunderstandings after-the-fact. It avoids finger-pointing and, ultimately, legal disputes. 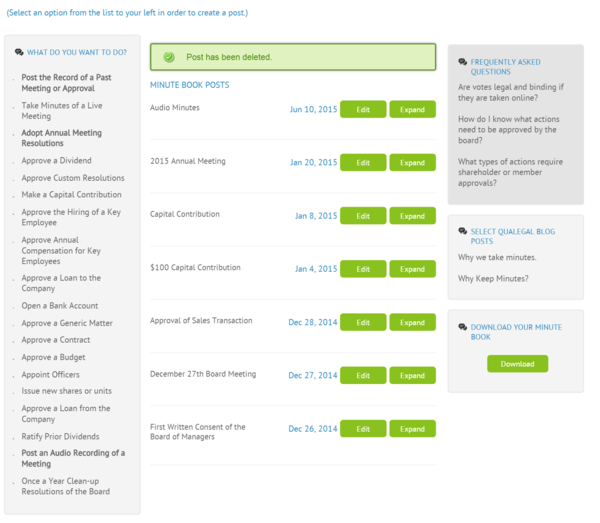 After Incorporation's online minute book keeps your records in chronological order and is searchable and printable. It keeps the information you refer to most at your fingertips with a summary of your company's management, shareholder listings and key dates. Its voting feature lets you pass resolutions without pen and paper. It is always accessible to those you have given permissions to. And, like all of AI's tools, you can maintain it yourself or take advantage of our low-cost services to create minutes, organize your records and keep them updated. You only pay for the services you ask us to perform. Your online account is free.